We'd like to share with you a few key points on what makes a great crawl space dehumidifier, as well as what you can do to make sure it's working. Eliminate damp, musty odors in your crawl space once and for all by drying and filtering the air! Foundation Supportworks, Inc. can help you choose and install the best dehumidifier for your home. If you'd like a free crawl space dehumidifier quote, send us a call or e-mail today! 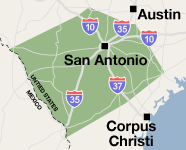 Our service area includes the Texas area, particularly Uvalde, Converse, Boerne, Schertz, Floresville, Lockhart, Universal City and many areas nearby. Our SaniDry™ CX™ has got you covered. With a self-draining design, it can remove up to 109 pints of water per day in your crawl space, without ever needing to have its collection tray emptied. It can empty to a sump pump or drywell, or a special condensation pump can be added to discharge the water outside of your home. The SaniDry™ CX™ is a crawl space dehumidifier that's strong enough for the job! Its powerful 240 CFM blowing motor will circulate air throughout your humid crawl space, drying everything out and keeping it dry all the time! The large cold coil surface of the SaniDry™ CX (see comparison in photo) helps it handle a 6,000 square foot crawl space, at 3" high. An adjustable knob lets you decide how dry you want your crawlspace -- just set it and forget it! Our SaniDry™ CX™ Crawl Space Dehumidifier has a unique heat exchange system that helps it achieve an ENERGY STAR® rating! Our system can remove up to 109 pints of water per day, using a powerful 300CFM fan that keeps dry air circulating all over the space. With an operating temperature of 40°F - 95°F, it's optimal for the cool crawl space environment! Install a Warrantied SaniDry™ CX System in your crawl space! This innovative system is ideal for helping to keep your crawl space or basement warm, dry, and mold-free! A SaniDry™ CX can be installed in your home quickly, and includes a written warranty. Let us help you dry your crawl space! Call or e-mail Foundation Supportworks, Inc. today for a free crawl space dehumidifier quote! We service the Texas area, including Uvalde, Converse, Boerne, Schertz, Floresville, Lockhart, Universal City and nearby.